My name’s Renai LeMay. I’m an Australian writer and technologist. No, that’s not a real photo of me. In my day job, I’m an IT Project Manager. You can find out more about my professional life through my LinkedIn profile. In my spare time, I write articles for this site (mainly about science fiction and fantasy literature), as well as writing science fiction and fantasy novels. I haven’t published any novels just yet (they’re on the way), but I have published a non-fiction book on technology policy. Entitled The Frustrated State: How terrible tech policy is deterring digital Australia, it’s available for purchase on Amazon.com.au (as an eBook) and Amazon.com (as both an eBook and in print). One of my earliest memories as a child is being fascinated with a series of three or four books which sat on the voluminous bookshelf in our family’s living room. I couldn’t yet read very well, nor did I really know what kind of books adults might read (they had no pictures to help puzzle out the words), yet there was something indefinably special about these books which drew me in. The spine of the books featured the same lettering, spelling out a single bold title, with a handful of subsidiary words. This, and the overall art style of the picture on the front cover, made the books clearly part of a set. Yet some of the subsidiary words were different, and the colours and art which clothed these books separated them. It was only much later, when I was reading the series as a young adult, that I realised how truly remarkable this series of books was, and how right I was to have been drawn to them. 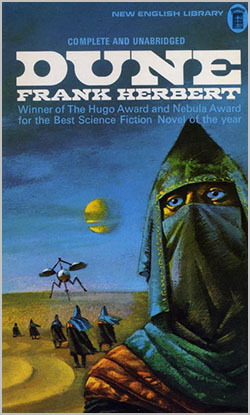 The series was, of course, Frank Herbert’s seminal saga Dune, widely regarded as one of the greatest science fiction masterworks ever published. It must be said that science fiction and fantasy is always a creation of its time. The incredible discoveries in the physical sciences which gave the world nuclear energy and the atom bomb in the 1940’s also gave inspiration to scientists turned writers such as Isaac Asimov. The harsh reality of military conflict spurred the 1960’s freedom movements, and also the revolutionary writing of Robert Heinlein. And as the lure of technological dystopias began to fade, William Gibson was there to paint us a picture of deeply unintended technical consequences. Fantasy too, has its eras and its masters. The horrors of the first and second World Wars gave birth to Tolkien’s epic visions of good and evil. 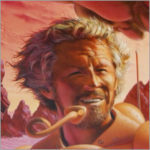 Although it would take some time for the fantasy genre to come to maturity, those visions were eventually transmuted many decades later for a perhaps more optimistic modern age by writers such as Robert Jordan, Robin Hobb and Janny Wurts, before George R. R. Martin undercut them with a harsh dose of savage reality. And these days, it is modern masters such as Brandon Sanderson and Patrick Rothfuss who are carrying the fantasy torch into a new era. But just as science fiction and fantasy books are always a creation of their time, they are also timeless. One does not need to have knelt in the trenches of a World War to feel the sense of hopelessness that infuses so much of The Lord of the Rings. And Gibson’s cyberpunk reality is just as relevant in 2014 as it was 30 years ago when it was first published, despite the fact that so much of Gibson’s original vision is now coming to pass. I have been many things in my life: An IT professional; a journalist and a political staffer. But at the deepest core of who I am is a more fundamental concern with the idea of what it means to be human. It is this question which has always drawn me to writing like a moth to a flame. Because writing — and especially books — show us who we are. As I have grown older, I have read the Dune series many times. Its concepts, its characters, and its philosophies continue to influence my thinking greatly. And every time I discover fresh thinking in Frank Herbert’s writing that I had overlooked previously. As I have grown in understanding as I grew older, so Dune always has new lessons to teach me. So it is with all great books. It is my hope that my writing — on this site and in my books — can contribute back to this great human journey that we are all on, as so many authors have done before.